This handsome 1976 grey stallion by Taga and out of the Ferzon daughter Lazona proved handily that a breeding stallion could also be successful in the show ring with amateur riders aboard. 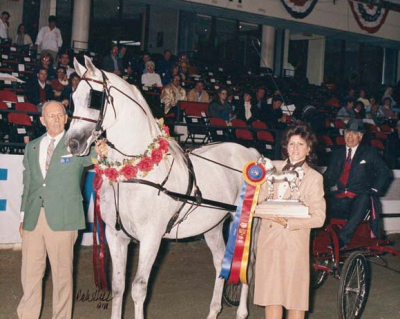 Competing in English pleasure and driving, Royal Taga was U.S. National Champion Arabian Pleasure Driving horse in 1988, besting a class of 26 horses. His titles also included a Scottsdale driving championship and Canadian Reserve championship. Royal Taga is the sire of 40 Arabians and Half-Arabians, many of which have had successful show careers. Sadly, Royal Taga died in January 1989 at the height of his career.